Mobile phone firm Orange has sold nearly 30,000 iPhones in France, just five days after it was launched. 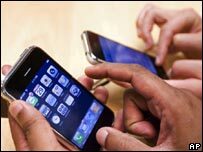 Mobile companies mostly sell iPhones to customers who take out network contracts with them, a point of contention for some consumers. About 80% of the phones were sold for 399 euros on a special Orange tariff plan, with 15% sold for 549 euros on a regular Orange tariff plan. The rest were sold for 649 euros. For 100 euros extra, these can be unlocked. Some may have been unlocked for use on other networks, but it is not clear how many, Orange says. Orange says that 48% of people buying the phones were new customers for the network. On Tuesday, a German court overturned an injunction that had forced T-Mobile to sell unlocked phones. In the two weeks that the injunction was in place, T-Mobile sold unlocked iPhones for 999 euros, compared with 399 euros for a phone with a two-year contract. The company has not revealed how many unlocked phones it sold at that price but says it did sell some. The exclusive agreements between Apple and mobile operators have caused controversy outside France, with software circulating online that claims to unlock the iPhone. Apple has warned that hacking into the phone's software could render the phones "permanently inoperable" if software updates are downloaded.